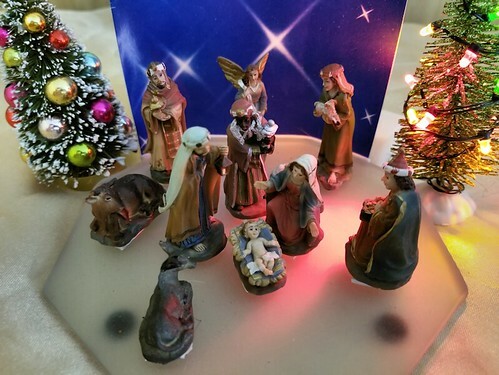 While putting up a few more Christmas decorations, I took the time to change out the batteries for some lights in our nativity scene. It is the teeniest of nativity scenes. The tallest figures are maybe three inches high. I started decorating the dash of the van we have now, but the surface is different, and the temporary adhesives don’t stick as well. I only managed a bit of bling, my Happy Face (a rockfish), a toad, some turtles, tortoises, frogs and lady bugs. Also, the toad is holding a tiny Groot. Chances are the dash surface is polypropylene or polyethylene, which is a “low surface energy” plastic. These types of plastics are a challenge for most “glues”. Special glues are made for these plastics…you’ll just have look on the packaging on whatever you’re buying to find one that says it works on those two “poly” plastics. A good auto parts store will likely have something that will work. Getting the stuff off after the holidays….since most of those “glues” don’t work well at high temperatures, gently heating the area with a blow dryer will make life a lot easier. The challenge is that I want it to be temporary! Lol I could find all kinds of permanent solutions, but I want to be able to take them off again, if needed. The bling is usually self adhesive scrapbooking materials. The other stuff, I used FunTack. That’s what is holding things on my dash now, plus I tried glue dots (more scrapbooking supplies; very handy!). It took heat for them to finally stick and stay stuck. Well. Some of them. My toad is just happens to be in a stable spot, until I knock it about while cleaning my dash!